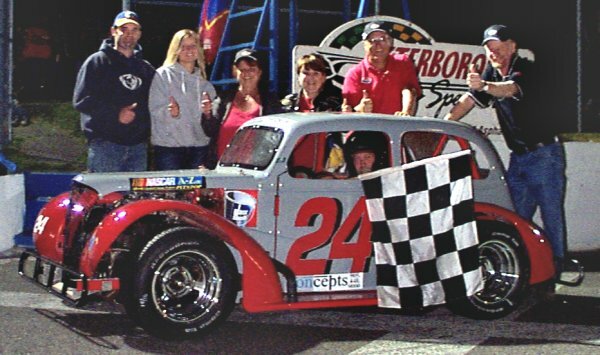 For a second time this year the Tribospec / Sunoco Lubricants Ontario Legends Series had a fast and furious feature race at Peterborough Speedway. The caution free 25-lap race had an average speed of 119 km/H (74 mph). . The feature started with Rob Degeer (# 37 H B Cycle) on the pole followed by Andy Warbutton (# 24 Shoeless Joe’s), Bruce Grimes (# 88 Tascor Construction), Kevin Fletcher (# 1 It’s A Wrap) and Bill Mason (# 4 Cathy’s Creative Sewing) the top 5. Last week’s winner Steve Navratil (#55 Super Tint) starting at the back of the pack. As the green flag dropped Degeer successfully fended off Warbutton trying to pass on the outside, by lap 2 Warbutton had been shuffled back to 3rd behind Grimes. The next couple of laps had Warbutton passing Grimes down low and then working on Degeer finally making the pass, on the low side, taking Grimes with him. Meanwhile back in the field Navratil was working his way up to the front as Degeer faded and finally pulling off the track on the 23rd lap. The heats had Grimes with 2 wins Navratil and Warbutton with one each. The Ontario Legends return to Peterborough Speedway Jun 11 th.